string(1144) "Resource Centre > Uncategorized > The great palm oil scandal: Labour abuses behind big brand names"
This report investigates labour exploitation on plantations in Indonesia that provide palm oil to Wilmar, which is the world’s largest processor and merchandiser of palm and lauric (palm kernel) oils and controls over 43% of the global palm oil trade. The report also traces the palm oil produced in Indonesia for Wilmar to a range of consumer goods companies that use palm oil in their products. The investigation is based on both fieldwork in Indonesia and desk research. 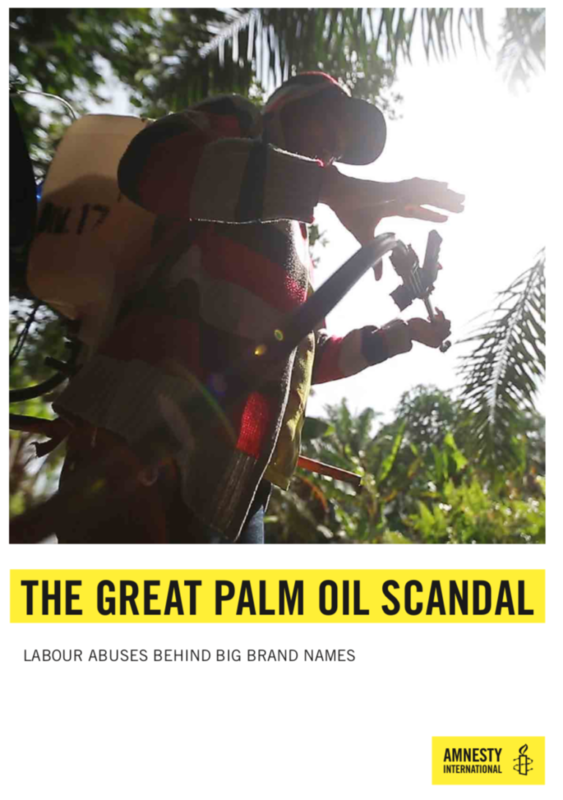 Researchers interviewed 120 plantation workers, including workers holding supervisory roles, on plantations directly owned by two Wilmar subsidiaries and on plantations owned by three companies that supply oil to Wilmar’s Indonesian refineries. The two Wilmar subsidiaries are PT Perkebunan Milano (PT Milano) and PT Daya Labuhan Indah. The three suppliers are PT Sarana Prima Multi Niaga (SPMN), PT Abdi Budi Mulia (ABM) and PT Hamparan Masawit Bangun Persada (PT Hamparan), part of the BEST Group, which supplies Wilmar. Wilmar, SPMN, and all but one of its buyers whom Amnesty International contacted, are members of the RSPO. Amnesty International found serious human rights abuses on the plantations of Wilmar and its suppliers. These included forced labour and child labour, gender discrimination, as well as exploitative and dangerous working practices that put the health of workers at risk. The abuses identifed were not isolated incidents but due to systemic business practices by Wilmar’s subsidiaries and suppliers, in particular the low level of wages, the use of targets and ‘piece rates’ (where workers are paid based on tasks completed rather than hours worked), and the use of a complex system of fnancial and other penalties. Workers, especially women, are employed under casual work arrangements, which make them vulnerable to abuses.